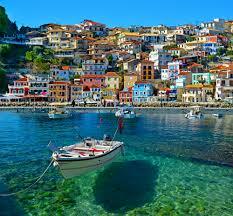 Search and book holidays in Corfu. Corfu is a very good choice for summer holidays as a wide variety of packages are available as well as great All Inclusive and holidays for families and couples too. 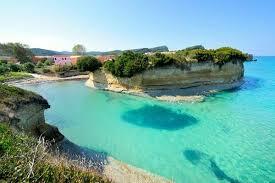 Corfu late deals are also easy to find in this Greek Isle blessed by warm temperatures throughout the summer. Known as the Emerald island, Corfu has two hundred kilometres of coastline with long golden, sandy, white pebble and shingle beaches. Forty resorts and two hundred villages are scattered amongst ancient olive groves, lush green cypress, orange and lemon trees. Fascinating landscapes in numerous shades of green are fringed by aquamarine blue seas. You will discover a sophisticated cosmopolitan capital, breathtaking panoramic scenery, quaint fishing harbours and elegant marinas, pastel-painted Venetian houses, brilliant whitewashed Byzantine churches and secluded coves. Corfu island is not short of vibrant nightlife either! Lively bars, trendy tavernas, rustic restaurants and fast food diners are plenty and will tempt you to while away the hours. Also on hand are popular watersports and a charming championship golf course if the leisurely pace of life gets too much! The island of Corfu is located just off the West coast of Greece. Holiday in Corfu and enjoy a mild Mediterranean climate along with excellent corfu holiday beaches making it a popular holiday destination, especially with British holiday makers. Corfu island is very green compared to other Greek island holiday destinations. Hot and dry summers along with winter rain creates lush vegetation which is dominated by over a million olive trees. These olive trees on Corfu are the main cultivation, although Corfu’s tourism now provides the most income. The main holiday resorts and beaches on Corfu are Benitses holiday resort, Dassia holiday resort, Saint George holiday resort, North and South, Ipsos holiday resort,Kavos holiday resort, Kontokali holiday resort, Paleokastritsa holiday resort, Roda holiday resort, Sidari holiday resort, Perama holiday resort, Moraitika holiday resort, Corfu Town, Aghios Ioannis holidays resort. 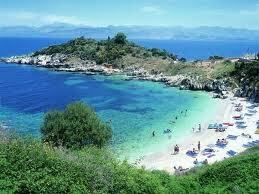 The Greece holiday island of Corfu has some of the Ionians most beautiful beaches. There is a great variety of beaches all around the island. Most of them have been turned into resorts proposing many accommodations, restaurants and bars. Some of these beaches have also been awarded by the Blue Flag, the European guaranty for their cleanliness. Holiday beach resort of St George, situated 30 km south of Corfu Town. The beach holiday Resort of St George is one of the most beautiful beaches of Corfu and is one of the few that is not situated near a village. More about Holidays to St George..
Holiday beach resort of Paleokastritsa, situated 26 kilometres northwest of Corfu Town Paleokastritsa is the name of the most famous picturesque village of the island of Corfu with also a beautiful beach. More about Holidays to Paleokastritsa.. The fishing harbour of Roda has recently became a modern touristy resort, concentrating many restaurants and lively bars in the old part it. More about holidays to Roda..
Holiday beach resort of Dassia on the east coast of the island, above Corfu Town This beach resort is full of tourists and there are large hotel complexes all along the back of it. The beach is pebbly. More about holidays to Dassia..
A long and isolated sandy beach located near the village of Agios Matheos. More about holidays to Corfu Town..
More about holidays to Perama..
More about holidays to Ipsos. Corfu Town has everything from the most beautiful esplanade of Greece, Venetian buildings and monuments, Byzantine churches and fortresses, museums, the palace of St. George & St. Michael, as well as plenty of tempting shops! This much photographed pretty islet is found just off the coast of Kanoni and is well worth a visit. Boat trip over to Parga and Paxos (full day out). Take in the Achillion, Bella Vista, Paleokastritsa and Kanoni. Offering breathtaking views of the entire island and located on the highest peak is the Monastery of Panokratoras, housing frescoes and icons from the 14th and 15th centuries.